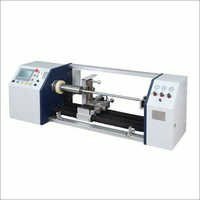 With the backing by our group of persevering experts, we have come to at the position as a conspicuous producer and supplier of Auto HSF Roll Cutting Machine. It is produced utilizing quality-affirmed parts with ultra-cutting edge innovation to go along all the quality parameters set by industry. This machine is utilized for cutting the moves into required shapes and sizes. Our profitable clients can benefit this Auto HSF Roll Cutting Machine from us debatable costs. We ensure our roll cutting machine is fabricated with precisely on the basis of international quality parameter. We produce the machine with global quality standards for various functions in diverse industries. We have a well-connected distribution network where we deliver our products within a specific time frame. The machine has a superb efficiency with high functionality. It is appreciated for low power consumption and high output. It requires less maintenance and easy installing. It is available in a competitive price.